táami berry will last between 20 minutes to two hours depending on how much you eat and how long you keep it on your tongue. One serving of crushed táami will last 20-45 minutes, and fresh frozen táami will last between 45 minutes and two hours. NOTE: táami berry must be consumed before eating or drinking the desired food. Tear the single serving packet at the perforated edge and pour crushed táami berry on tongue. We provide many delectable recipes for pairing with our crushed táami berry products. For best results, keep crushed táami berry in the freezer or refrigerator. 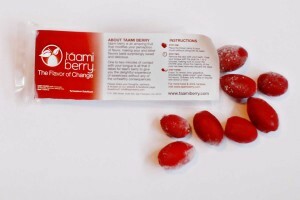 Simply place berry in mouth directly from freezer or allow táami berry to thaw for 5-15 minutes out of the freezer before consuming. Take care not to let the berry sit out for too long as it is extremely perishable. Move táami berry’s pulp around in your mouth, allowing it to coat your entire tongue for at least one minute. Swallow the berry skin, but do not bite into the large seed, which is quite bitter. Once the majority of the white fleshy matter has been removed from the seed, remove the seed from your mouth and begin your experience. We provide many delectable recipes for pairing with our Fresh Frozen táami berry products. It is possible to add crushed táami berry directly to a drink, or on top of a food, but its effectiveness is decreased significantly (roughly 50% – 100%). This is because Miraculin is a glycoprotein that works by coating taste-bud receptors. If you were to drink a juice with the crushed táami mixed in, it would dilute the effect of the Miraculin. Furthermore, if ingesting via a drink, you wouldn’t keep the juice and crushed táami in your mouth for long enough to achieve optimum effectiveness. The thicker the food and drink medium (i.e smoothie, or yogurt) the better the combination of crushed táami berry works.